The Travelling Lindfields: The 7 most annoying things in hotel rooms and how to fix them! Price wasn't always an indicator. One of the worst places was a disgustingly expensive small private hotel in Martha's Vineyard, while some of those which left me with the fondest memories were the two-star auberges we stayed in on our first trip to Europe. This week, therefore, I am going to devote my blog post to advice - the 'I could do your job better than you could' kind of advice. I am sure every single person who reads this will have their own favourite suggestion on how to improve their next hotel experience. If you do, please let me know what it is in the comments section, then share the post with your - favourite - hotel manager. 1. Vacuum under the bed. I spent decades travelling with small children, My final check of any room was to look under the bed for errant toys, clothing, toothbrushes, small siblings or anything else the boys might have stored there. What I always found was dust and assorted debris. I get that cleaners don't get paid much and I get that they have to clean rooms quickly sometimes but PLEASE I do not want to share my little patch of the planet with someone else's dirty socks, underwear, used tissues or half-eaten sandwiches. Just do us all a favour and vacuum under the beds. What is the weirdest/grossest thing you have ever found under a bed? Do you manage a chain hotel in North America? If so, this tip is for you. Did you know that every single one of your guests leaves a little bit of themselves behind? Mix together the intoxicating aroma of thousands of take-away pizzas, sweaty socks, passionate encounters, body odour and assorted colognes and you create a cauldron of malevolence of which the witches of Macbeth would be proud. Turning the air-conditioner on for a couple of hours just doesn't cut it. You need to open a window. Unless the temperature outside is sub-artic, do this more than once a decade! If you can't open the windows yourself at least let the guests do it. Why on earth are so many chain hotels built with windows which can't be opened? 3. Ditch the 'If you would like to save the planet, re-use the sheets and towels' signs - or at least be honest about your motives. Refer here to suggestion 2. Absolutely no-one believes you care about the planet! If you did you wouldn't force guests to run the air-conditioner 24/7 because the windows don't open. I am all for reducing carbon emissions, greenhouse gases, electricity use, gas consumption, water consumption and - well the list is endless but you get the idea. I just don't believe you are - and if I was really serious about saving the world, I wouldn't travel at all, I would stay home and grow vegetables instead. 4. Buy new sheets and towels before the old ones go grey. If I owned a hotel, I would insist management use the sheets, towels and bathrobes in their own homes for their own families. Give them a week of drying off their freshly laundered children on thin, grey, mystery-stained bits of dishcloth and they would run to the nearest manchester store cheque book in hand. Am I alone in thinking that fluffy white towels and crisp linen aren't too much too ask for? 5. Check the T.V remote works. just so I can change the channel. Please just once in a while check the T.V remote actually works. 6. Check the light globes in the bed-side lamps. Refer to suggestion 5. You can check the lamps at the same time as you are making sure the T.V remote works, and I won't go blind trying to read by the light of the television which I can't watch because I can't change the channel! What hotel room appliance do you find most annoying when it doesn't work? 7. If your fire alarm has a hair-trigger - FIX IT! Our personal best was evacuating a room on the 8th floor four separate times in the middle of the night. We were all in bed fast asleep when the fire-alarm from hell sprung to life in a screech reminiscent of a banshee being tortured to death. The boys were little, I was unnerved and David was furious, but we all dutifully headed down eight flights of fire stairs (it is too dangerous to use the elevator during a fire) stumbling and complaining. David and I both wear contact lenses and had removed them for the night, so to get a true picture of how much fun this was you have to imagine us bumping into things, tripping, falling and cursing, all the while trying not to lose myopic sight of our children in the crush of other evacuating guests. I had an emergency pair of glasses which were about 10 years out of date. David had none. Having made it to the safety of the street outside, we waited in the cold with our fellow hotel inhabitants most of whom were also in various stages of undress, until finally half a dozen bored and annoyed fireman filed past us. They didn't even look for a fire. It was clear this had become a regular nightly ritual for them. They simply turned off the alarm and left - only to repeat the performance again about an hour later and then again and again. By the third or fourth time David, myself and our tired, cranky but highly amused children gave up and stayed in the room trying to ignore the regular warnings of death and destruction. David and the boys managed a couple of hours sleep. As mothers do, I spent the night worrying each time the alarm rang that this time there might be an actual fire and we would all be incinerated in our beds. There wasn't, of course, and we weren't but I couldn't be sure at the time, so PLEASE if your fire-alarm is prone to going off again and again for no apparent reason - FIX-IT! Just as a footnote I should add that my concerns about the alarm being for real were not completely based in fantasy. I was once in a hotel which did burn down. Fortunately no-one was hurt. On that occasion my mother saw the fire start and we began to leave the building before the alarm rang. What do you think of my list? Have I missed anything? Of course, I have. Please feel free to fill me in on your favourite hotel nightmare story or constructive suggestion. I am all ears. 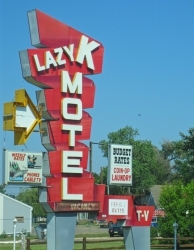 My apologies to the proprietors of the Lazy K Motel. I have never stayed at your establishment. I just like the sign. I am sure your hotel is of the very highest standard! Thank you for taking the time to read my blog. If you would like to follow our travels, enter your email address in the 'Never miss a post: Follow by email' box in the right hand sidebar just below my profile picture. Premium economy: is it worth the cost? I am a big fan of pedestal beds in hotels. No underneath so no dirt and no need to check for missing things. The most disgusting thing I found under a bed was a "hygiene product" in a used condition (eww). One of the worst scenarios I ran into? Booked a room in a "nice" chain hotel. Next door was booked an "after party" from a wedding or prom. The hotel's response to the loud party at 2AM? What do you want me to do? They booked the room for that purpose. They fixed it but not without disgruntled customers (and some very tired kids the next day). If you expect nothing else from a hotel room it is the ability to get a good night's sleep. That is why the fire-alarm saga has struck so firmly in my mind through the years. I know the 2AM party would have been awful but David swears we stayed in a hotel in San Francisco once where there were regular drug deals going on in the room across the hall. I slept, blissfully, through the whole thing. We checked out the next morning. Check the radio alarm clock in every room and turn it off! Twice in my life I have been kept awake half the night by a radio alarm automatically turning on at a set time - in an unoccupied room NEXT to mine. Both times in B&B establishments with no night attendant. Grrr. Oh you are so right. I had forgotten about the middle of the night alarms with a mind of their own, set no doubt by the previous occupant. I should have made my list 'The 8 most annoying things ....' Our worst experience of one of these alarms was when it was built into the T.V. Bang on 4 am the TV came on with the volume up high. Airport hotels are the worst for this problem. We ALWAYS unplug the radio alarms before we go to sleep. It is so much easier than trying to work out how to turn them off. Yes - we have had some truly memorable hotel stays seared into our vast collection of holiday memories for all the wrong reasons. I know what you mean about curtains letting the light in. After a particularly bad run of these rooms on the Alaska Highway when the sun wasn't setting at all we learned the value of packing eye masks. Yep definitely pet peeves! Why can't they just say use the same sheets and towels so we can save some time/money! I know it doesn't sound nice, but it's true. Thanks for sharing on #TheWeeklyPostcard. Haha! I have just had a friend email me with exactly the same suggestion. She says hotels should offer 10% off the room rate if you use the same sheets and towels. It would seem that I am not the only person suspicious of hotel managers' motives. 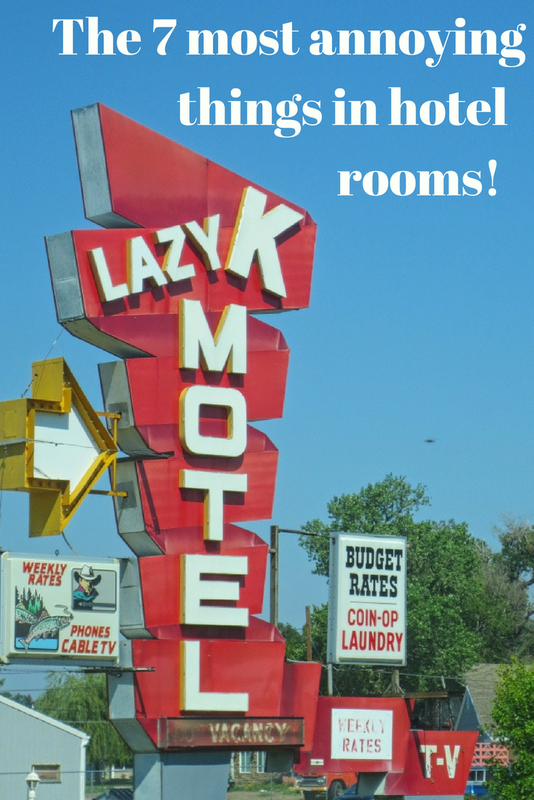 I must say we have been lucky with the hotels we've stayed in and can't add anything to include on your list but I really enjoyed reading about the things that can make a hotel stay memorable for all the wrong reasons. You should borrow my template and do one for cruise ships. I am sure there must be a list of things which annoy you about cruising. I think I gave up on hangers so many years ago I don't even notice how few there are now. We hardly ever stay anywhere long enough to unpack but even so we run out of hangers. You have made me laugh with your reasoning on why the hotel windows don't open. I wonder if it saves money on construction somehow but I can't imagine how. I once worked in a 50 storey office block where the windows wouldn't open. I assumed then that it was to prevent people accidentally falling out. When the air conditioning stopped working during one of Sydney's famous (and long in the past thank heavens) electricity strikes it was like working inside a sauna. #3 - never thought about it that way, ha! Although, I do appreciate earning extra Starwood points for opting out of housekeeping services. I just read a hotel review where the remote control was sealed in a sanitized bag...pretty brilliant, I thought! I have had remote controls with bits of pizza stuck to them but never in a sanitized bag. Do you think they actually clean the remotes or do they just stick them in the bag so you think they have been cleaned. Spot on for each! My biggies are windows that won't open and no electrical outlets that don't require rearranging the furniture. Thanks for the inspiration and for linking up this weekend at #wkendtravelinspiration! I always thought I was the only one who wanted to open windows but so many people have agreed with me on this I realise it is a common irritation. David loves to rearrange furniture in hotel rooms. If anything isn't where he wants it, he just moves it. I hate it because it just shows up all the dirt which has found its way under the furniture. Lyn this made me chuckle as many of these we have experienced as well. I will add a bathtub plug or stopper that actually works and ensuring the previous guests don't have the clock alarm set for 4am. The 4am alarm is definitely one of the worst annoyances, and as a fellow cyclist who loves to soak in the bathtub after a long ride I know what you mean about ill-fitting plugs. David is a chronic window opener. Even in winter, which to be fair is a pretty mild season in Sydney, we always have lots of windows open. I think hotel staff must get so used to the stuffy smell that they don't notice it after a while. Haha - great to know I have hit the nail on the head. My pet hate is having to run the coffee percolator to make a cup of tea or cup-a-soup. Somehow they don't taste quite right and it takes forever! I have noticed that some of the coffee percolators now have tea pods as well as coffee pods. I have never seen a cup-a-soup pod though. Thanks. I understood your point, and I also find it frustrating. David, my other half, hates it. You are right the hot water from the percolator never tastes quite the same. the tea always tastes like stale coffee! so does the coffee, though. I stayed in hotel in Edinburgh that had a property tea kettle in the room. it was heaven! Australian hotel rooms often have real kettles but the down side is that you only get instant coffee sachets and tea bags to go with them. Haha - I know what you mean about mirrors and toilets. I feel the cold like crazy so for me it is more of an issue if I can't turn the air-con down but it is just as annoying. All so true! I hate ending up rearranging all the furniture in order to get to a single outlet. I've taken to bringing an extension cord with three outlets on it. Then I only have to find one outlet to plug in my electronics. I don't know if you mind me including it here, but I wrote a post on the same topic a couple of years ago, and one of my points was about a remote that didn't work! Please feel free to copy paste the link here. I will head over to your blog and see if I can find it. David and I often travel with an extension cord but it sometimes feels like we have to bring the whole house with us. love this. in the U.S. anything that is inconvenient like windows that don't open has to do with the fear of people who will do something dumb, blame you, and sue (like open a window and fall out). my latest pet peeve is hard to find/scarce electric outlets when a family of three has a half dozen items to charge. Once we had a hotel put in Ikea foot stool in the bathroom so kids could reach the bathroom sink (ever notice hotel bathroom sinks are higher than normal?). it was genius and I don't know why more hotels don't do it. for $4 they'd have tons of parent loyalty. I have never noticed the sinks are higher. I wonder why. The whole window thing annoys me. I understand the liability issues but it still irritates me. Maybe U.S courts need to bring their damages verdicts back from the stratosphere a bit. Sadly Australia seems to be following your lead, particularly in relation to super expensive class actions. Lynn, I love your comment at the end about using the photo of the Lazy K Motel. Love the picture. I could really sense your frustration...or anger at these annoying things in hotels. I agree with them all and sadly it brought up memories of a fire alarm going off in the middle of the night in Cambridge, Mass. But this doesn't compare to the THREE four alarms that you had to endure. The alarm story I wrote about was the worst we have endured but it wasn't the only time we have been pried out of bed in the middle of the night by hair-trigger alarms. The worst thing about them is that after a while you get very complacent and one day there might be a real fire, which scares me a lot. OMG - 25 floors back up to bed after evacuating. I think that would drive me nuts. Living on the 25th floor must have been quite something though. My husband travels 4 nights per week for business in a different hotel each night and he's had so many unique experiences! I do tease him as the first thing he does when he gets to a room is start rearranging the "furniture" to make it to his liking - he puts the coffee maker where he wants and moves the desk out from the wall, checks the temp if there's a fridge and don't even get him started on the room's temp control - even if only for one night. But I know if I were him I would do the same! For me, it's the under the bed finds - ugh! Haha - it sounds like your hubby and mine are totally alike, except that David never travels for work. It would be nice just once in a while to have a whole day and evening to myself - just joking! Yes!! Especially the part about the open windows - enjoying other smells from previous room guests is never a good thing, even if it's pizza. It is enough to put you off pizza forever. Have you ever atched the show "Hotel Impossible" (it was on 94LIFE). If you want to see all the discusting microbs that are a hotel rooms that aren't cleaned properly. PS can they also wash the curtains. Haha - good luck with getting hotels to wash the curtains. I am happy if they just wash the sheets and towels occasionally. I remember watching a similar show to the one you mention. David loves those kind of shows. It was all about saving hotels from financial ruin when the owners didn't have a clue - and cleaning things up featured again and again. Haha - I need you to come to my place and tell that to my husband. He is completely incapable of closing a door quietly. When I saw the title of this post I knew I was in for a good read, and you didn't disappoint! I have to agree with your points, especially #3 as it's so transparent, and have plenty of my own these days. Refilling toilet paper is a big bugbear of mine as it's not something you want to sort out when you really need it. Making sure housekeeping actually close your door once they're done is another one! Thank you. I have never come across the 'housekeeping not closing the door' thing. I would not be happy about that and I agree about the toilet paper. As well as the comments you see here I often receive comments by email and through social media. This comment came this morning from Nora and John who have asked me to publish it on the blog as well. I can absolutely relate to this list. Especially the last two. I feel the cold and there is nothing more guaranteed to make me unhappy than having to sit in a cold hotel room with a big coat on. It is even worse when the public rooms like the foyer, lounge and dining areas are heated but the rooms aren't. It happened to us a few times on one of our early trips to Europe and I have never forgotten it. It was early in the tourist season and very chilly outside. I am pretty sure the hotels were just trying to save money so the room heating hadn't been turned on but they didn't want to frighten off potential guests so all the public areas were warm and cosy. The lack of room for bags is another of my personal bug-bears. It is hard to make a room tidy when you are tripping over your travel bags all the time. Sooooo much we could add to this list! The window thing made us chuckle. A relative who works "in the industry" tells us the windows don't open "for security" and cost savings. Apparently, many people like to run the heater/AC full blast AND open the windows. I get it, but still like having a window that opens. Thanks for joining #TheWeeklyPostcard! What you say about the rationale for non-opening windows is interesting. I wonder whether the cost of the open window and air-conditioning on group of guests would be off-set by the other guests who just open the windows and keep the air-con off - but I take the point.